Regular people may wish for Amazon gift cards. We would die for CVS gift cards. We spend so damn much $$$ at CVS on insulin and a myriad of diabetes supplies. Regular people may wish for restaurant gift cards. We do dine out but we would rather get Whole Foods gift cards. Those healthy diabetes-friendly foods, especially gluten-free foods, cost an arm and a leg. If we could have a shopping spree at Whole Foods it would be so much fun. Regular people may wish for a new phone. Eh. We want a used iPhone please so that we could use it with Dexcom Share and activate a phone line for V. A new phone is just too much fuss but a gently used iPhone 5 of any variety would do the job nicely. Alternatively, a gently used Android phone may be good as well for a DIY CGM in the cloud rig. See more about that below. Regular people may wish for FitBit. I understand it can track your sleep patterns. Why on earth would we want a device to remind us how often we have to wake up at night? Give us a Pebble watch please! As I mentioned, there is a DIY rig out there, called Nightscout, that we could set up and then use Pebble watches to monitor V’s BG remotely. 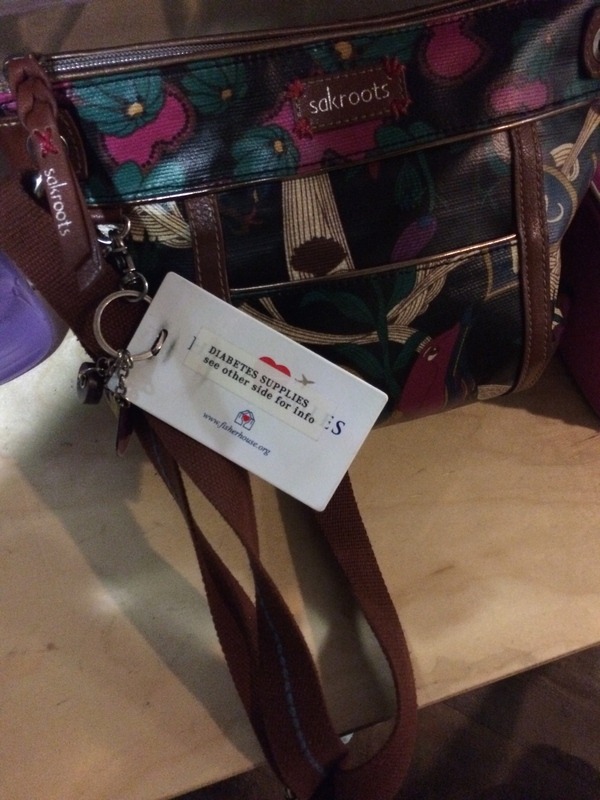 Regular people may ask for a Coach Purse. Pfffft! What we would love is a stylish, comfortable, extremely durable, gender neutral backpack that is just the right size to fit all the Diabetes supplies. It would not be too small or too big, and it has to be adjustable so that it could be comfortably worn by V or by us. Now, go find that, I challenge you! Regular people may ask for fine chocolates. We would ask for a supply of glucose tabs. Except right now we are well stocked on glucose tabs, so maybe we’ll settle for fine chocolates for the time being. Regular people may ask for fun electronic toys. Us, not so much. Please give us all the AAA batteries that we’ll use for the pump and hold the toys. We have too many electronic gadgets already. 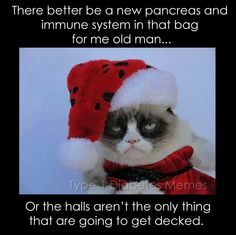 Except for an artificial pancreas, of course. That, we want yesterday! Regular people may ask for video games. Ain’t no one got time for that! We’d like another bike. Bikes are one of our favorite ways to manage BG! Yes, I fully recognize that we already have a bike problem in our family. We have four people and 6 bikes. Kids alone have 5 bikes between the two of them. But see, I don’t have one of my own. I’d love to get a Beach Cruiser so that when we go on family rides I don’t have to rent one. With the basket please, so that we can dump all diabetes supplies and snacks there. Any color will do. Regular people may ask for fine jewelry. We would prefer a stylish Medical Alert bracelet for V. Or I will happily accept a Diabetes Awareness necklace, such as this one. And then there is wine and coffee. You cannot go wrong with those. When it comes to wine and coffee, we are just like all other regular people. Except maybe we need it even more than regular people. After T1D diagnosis many families’ lives are turned upside down. There may be a lot of worry, confusion, even trauma. 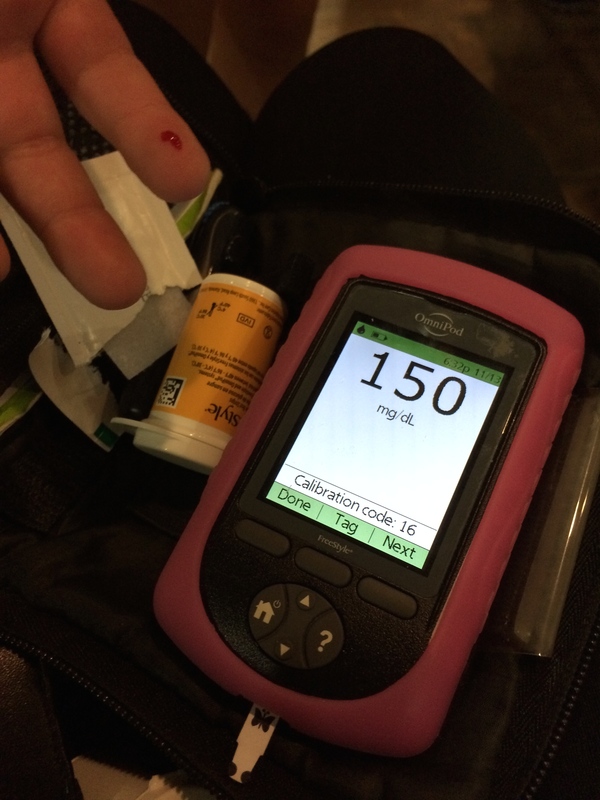 We were lucky to avoid a medical emergency and thus had a “soft landing”, if you will, into T1D world. But just as all other families, we walked out of the hospital with a tremendous burden. I remember one post-discharge moment very vividly. We were driving home back from the hospital and were a few blocks away from home. As we were driving down the street it struck me how surreal it felt. Here we were, coming back home as if we just went out to dinner or to visit friends. For a second I really wanted to pretend that it’s all it was. We just went somewhere and were coming back. But the reality, as surreal as it felt, was that we were coming home to a very different life. In a blink of an eye V went from perfectly healthy to having a chronic medical condition. Abruptly, we all went from a “normal’ life to life with T1D. When we got home, first thing we did was go through the fridge and cupboards and inventory the food. Can V eat this now? How many carbs in a serving? How can we make this work? Going through the kitchen actually provided some relief, as we realized that we could continue to make most of the meals we usually make, with some modifications. For the first time in a long time, if ever, we had to plan breakfast ahead. We ate dinner at the hospital that night, so it was soon time to put kids to bed. Once V fell asleep, I went to her room to check on her. She was sleeping so peacefully, as if nothing ever happened. As a cruel juxtaposition, on her desk there was all kinds of T1D paraphernalia – meter, strips, needles, insulin, juice box. My baby girl has diabetes. Can’t hide it, can’t even pretend it’s not there. Was this really our reality now or was I watching someone else’s life? I walked back to our bedroom and lost it a little, for the first time since diagnosis. There was no time for feelings in the hospital. It was too busy with learning and practicing, doctors and nurses, procedures and tests. And there was support – we were not alone in caring for our daughter and in fact she was mostly taken care of by others while we watched and learned. But that evening, in the quiet of our home, away from the business of the hospital, the reality began to sink in for the first time. This was now ours. The multiple BG checks, the injections, carbs calculations and meal planning, constant monitoring and assessment of symptoms, management of highs and lows, checking for ketones, constant planning ahead. This was our daily burden now. And the losses became more real, too. We lost the ability to be spontaneous, we could no longer leave the house without diabetes supplies – not even to walk our dog around the block. My husband and I had just gotten back from a weekend trip away. This was over for us for a foreseeable future. Forget about trips, it would be a while before our kids could go to their grandparents for a sleepover again. Would we even be able to go out on a quick date? Who would take care of V if we were not around? “I know it’s all going to be OK, but I find all this very upsetting” were the words that came out of my mouth that night, as I was fighting back the tears. T1D is relentless. Pretty quickly we were forced to accept the fact that there is no such thing is stability. 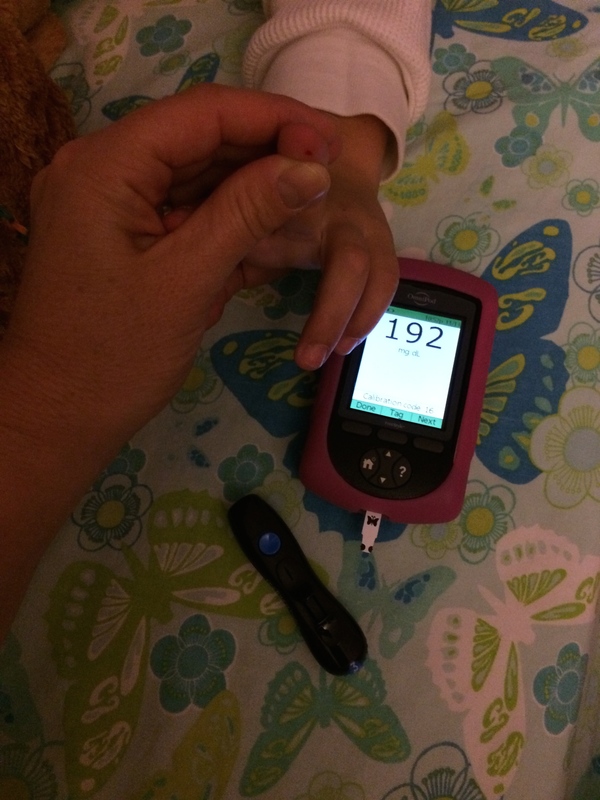 Please do not ever ask a T1D parent if their child’s diabetes is under control. It’s a question that at best we don’t even know how to begin responding to, and at worst feel enraged about. No matter how well we attempt to control all the moving parts – medication, diet, activity, stress, illness, and a million more – things still happen. BG can vary wildly, sometimes without any rhyme and reason. T1D management is a 24 hr a day, everyday job. You cannot take a break, you cannot take a vacation, you cannot forget about it. And even when you do everything right you can still lose. It does not play fair. It is not fair. For now a great deal of this burden is on us, parents, as it should be. We often help V with her pump and CGM, count carbs, prick her fingers, plan ahead, pack her things, check on her and give her reminders about her care. But she’s already taking on more than any 9-year-old should have. The other night she had a sleepover at her grandparents’ and needed to be woken up in the middle of the night to correct high BG, as her grandparents do not know how to operate the pump. If she is ever at a party or an event she needs to read labels, count the carbs and make a number of important decisions. We are always there for support, in person or by phone, but she has a lot of work cut out for her. She stepped up to the plate like a true champ and is able to do virtually everything independently when needed. It is not fair but it’s what she has to do to keep her life as “normal” as possible and do what other 9-year-olds take for granted – activities, playdates, sleepovers, not having a parent hovering over her shoulder at her friend’s Birthday party. In some ways she had to grow up too fast and demonstrate maturity and responsibility well beyond her age. For now, we help her carry this burden and take it off of her shoulders as much as possible. But every day she gets older it becomes less and less ours and more and more hers. And unless there is a cure soon, the day when it becomes all hers is fast approaching. 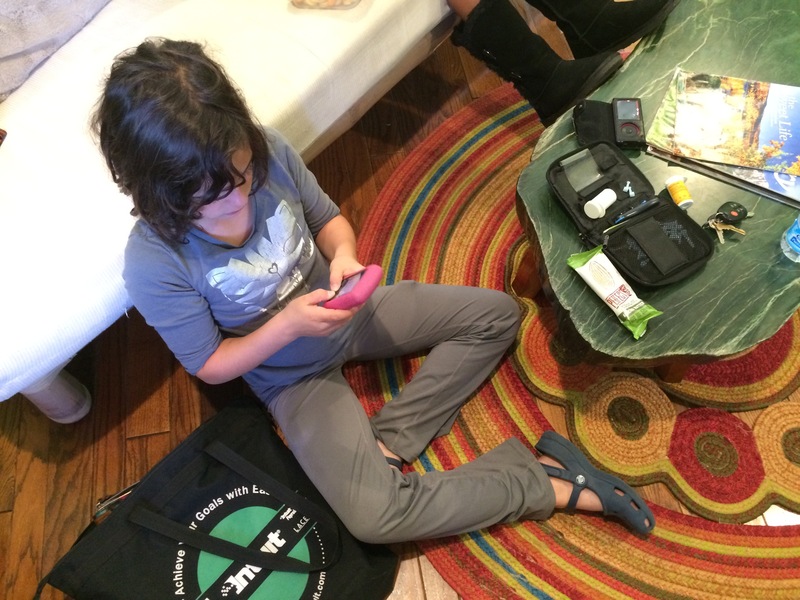 Here is a glimpse into our life with T1D. Yesterday – 11/13/14 – was a pretty ordinary day. It could have started at 1:34 AM. 1:34 AM is a permanent setting on my alarm clock. Often my husband and/or I wake up to check V in the middle of the night. But yesterday there was no need for it, her BG was stable and in a reasonable range, so we just let it be. Our morning started as usual around 7 AM. 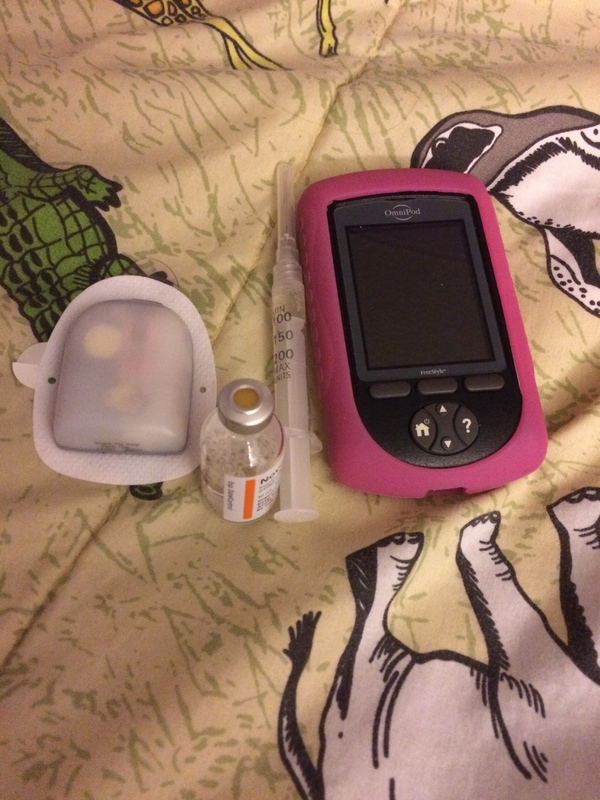 I had forgotten to take pictures right away, but typically we have breakfast at 7:30 and V checks her BG and gives herself insulin. Yesterday morning her breakfast number was awesome. 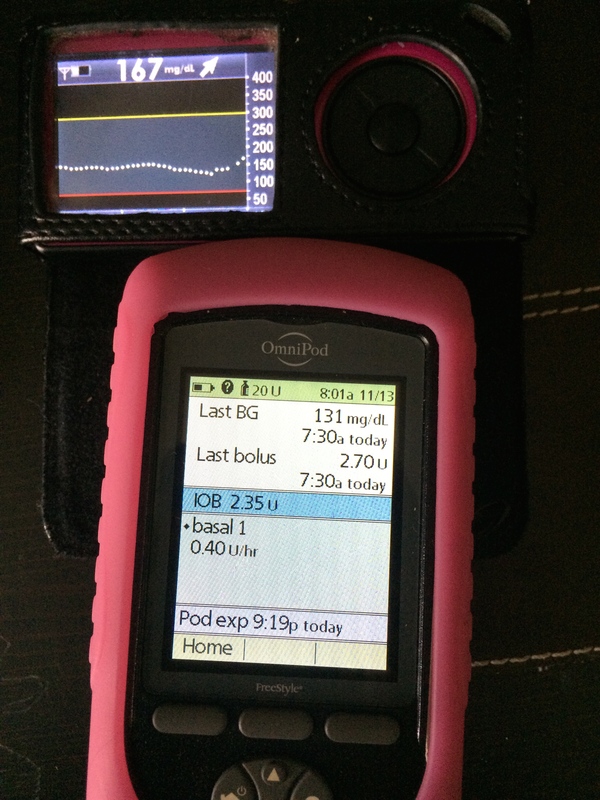 Here V’s PDM shows that she tested at 7:30 AM and had a BG of 131. This photo was taken at 8 AM after she had breakfast. Note the upward arrow on the CGM. Her BG is quickly taking off. I finish packing kids’ lunches. On the menu today is quinoa with GF chicken nuggets. Everything has to be carefully measured and carbs accurately counted. Every day I send a note with an itemized list of all lunch items and their corresponding carb counts. 1/3 cup of quinoa = 15 g.
4 GF chicken nuggets = 14 g.
I am usually not privy to V’s BG at school but it is not necessary. If there are any concerns the nurse will call me. And when I pick V up from school I always check her PDM and her CGM to see what’s been going on. Thursday is a short day so I pick up kids after lunch at school and we head to piano lesson. V wants a snack. 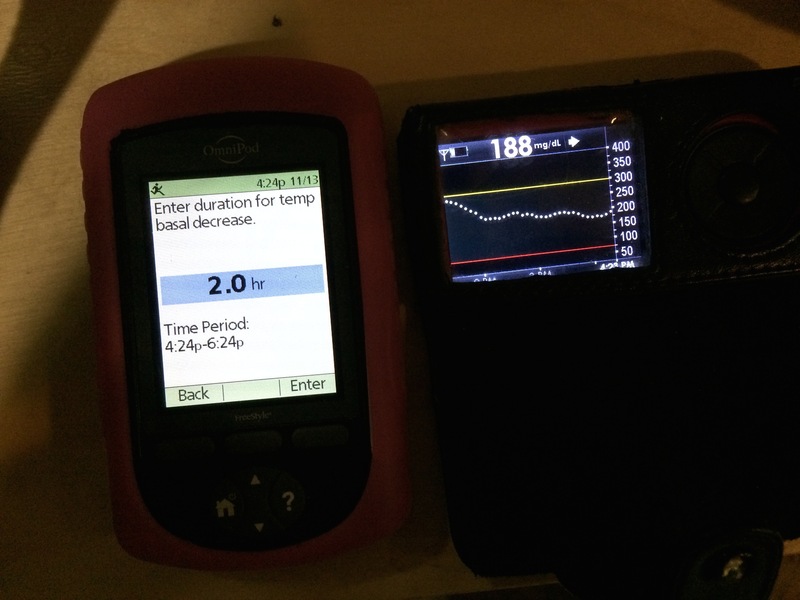 I take a look at Dexcom and I do not like what I see. 282 and going up, which is typical after a meal. Also look at the graph and note that after breakfast BG went up and stayed up. Since she wants a snack anyway, she checks her BG and gives herself a bolus while her brother is starting with piano lesson. After piano we come home for an hour to rest and change, and then head over to YMCA for gymnastics. We always have to look at BG before class starts and decide what to do about her pump settings. 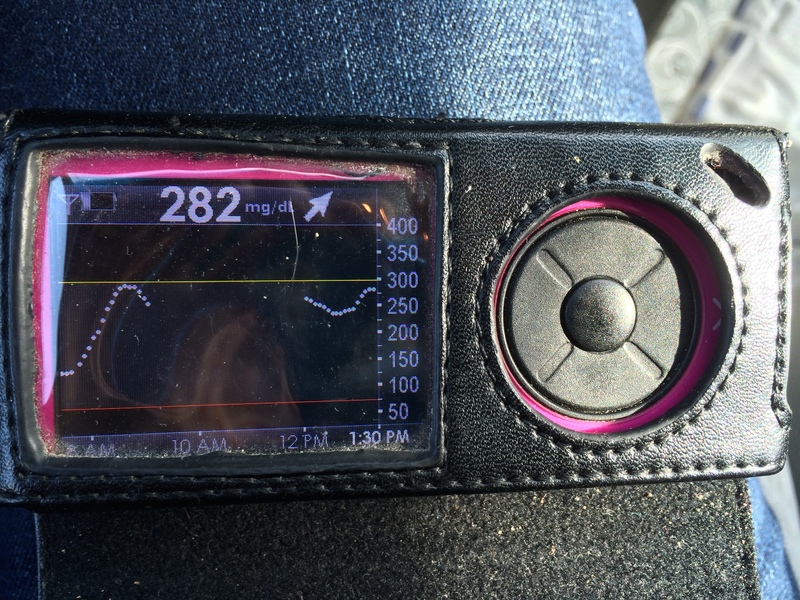 In this case, CGM says that BG is 188 and holding steady. I think about it. V has been running high most of the day and I could leave everything as is and let her “burn off” her BG. On the other hand, she tends to drop quickly and drastically with physical activity. I mull it over, consider the fact that there is almost no active insulin in her body, and decide to reduce her basal rate for two hours. Another notable thing is that I decide to forgo checking actual BG. We are relying on Dexcom data alone. CGM has been pretty accurate and reliable so we feel comfortable making some decisions based on it from time to time. We leave V’s kit outside in the hallway, she takes CGM into the gym with her, and I take a spin class across the hallway from the gym. Ready for Gymnastics! 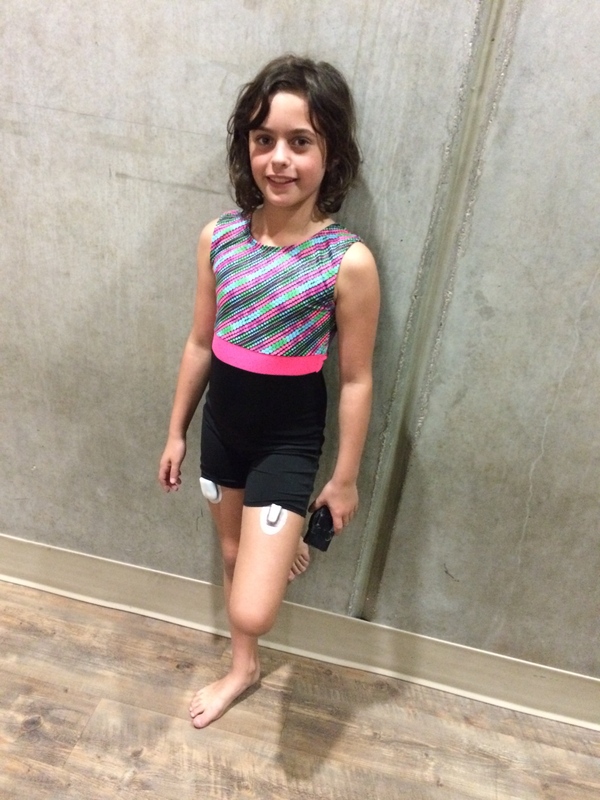 Pod on one leg, CGM sensor on the other, CGM receiver in hand, she is ready to take on the world. Move over diabetes, you are not going to stop this girl from doing what she loves. When I come out I notice that the kit was undisturbed, which means that V did not feel low/Dexcom did not alarm, so she did not need to test or treat her BG. V comes out 30 minutes later and we check. Did I make the right decision? We head home for dinner. 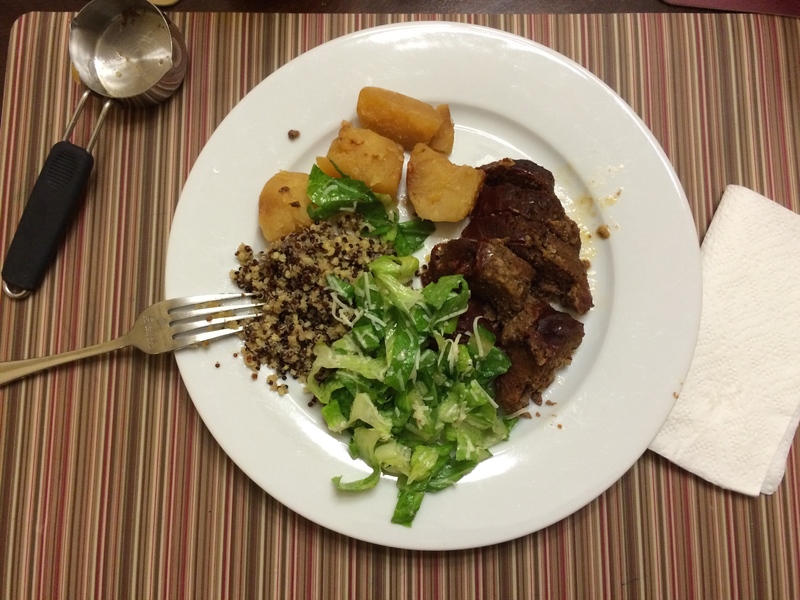 On the menu is meatloaf, potatoes, quinoa and salad. Once again everything is carefully measured and counted. You are looking at a 35g. carb dinner here. Little over 1/4 cup of potatoes = 10g. 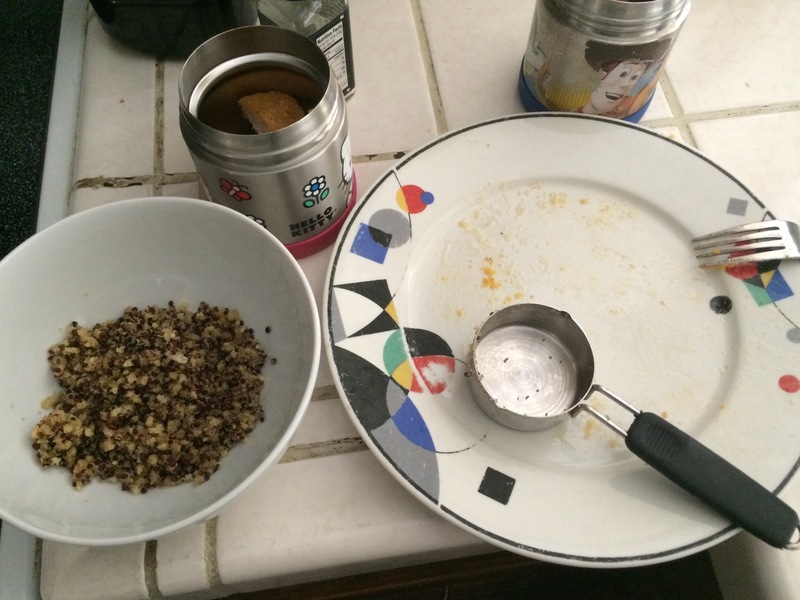 1/3 cup of quinoa = 15g. It is getting late but we need to change the pod. This is something we have to do every three days. While V is in the shower I start the prep. Once the new pod is on, V takes off the old pod. This is what her skin looks like immediately after pod removal. The marks usually disappear within a day or so, sometimes sooner. However, sometimes the cannula marks linger for a while, although they typically do not hurt or itch or bother her in any way. The skin is a little red, and the bump is where the cannula was inserted. V finally gets to sleep. Around 10 PM my husband checks on her before he goes to bed. She’s still a little high and he boluses her. I head to bed closer to 11 and do my final BG check. She sleeps through finger pokes and bolusing with the pump is non-invasive. We only need to wake her up if she is low and needs to take a fast acting sugar. V checked her BG 8 times. The good news is that she did not have any lows. The bad news is that her BG was pretty high most of the day. I mull over this data. V is still recovering form her cold, so the high BG is not surprising. But it would be great to get it down to a better range. I increase her temp basal overnight and set the alarm to 1:34 to get up and check on her. 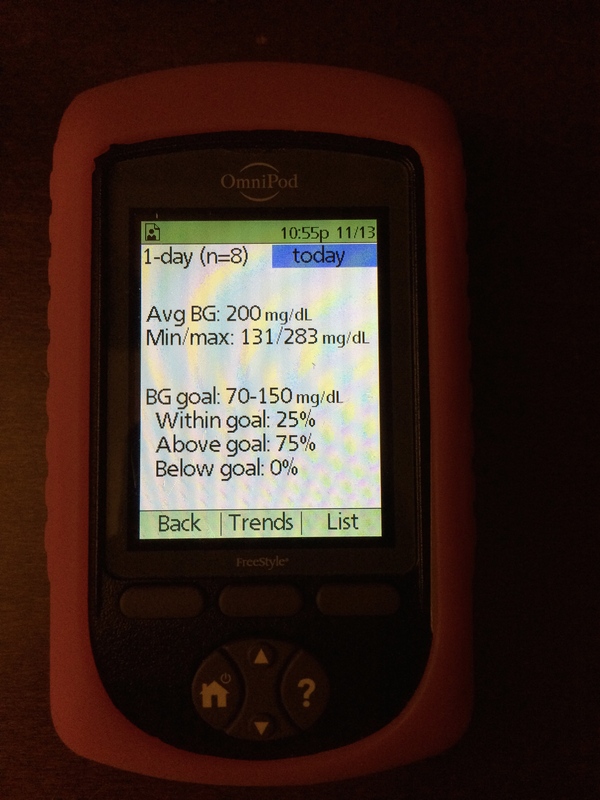 It only seems fitting to start 11/14/14 – World Diabetes Day – in the middle of the night with a BG check. 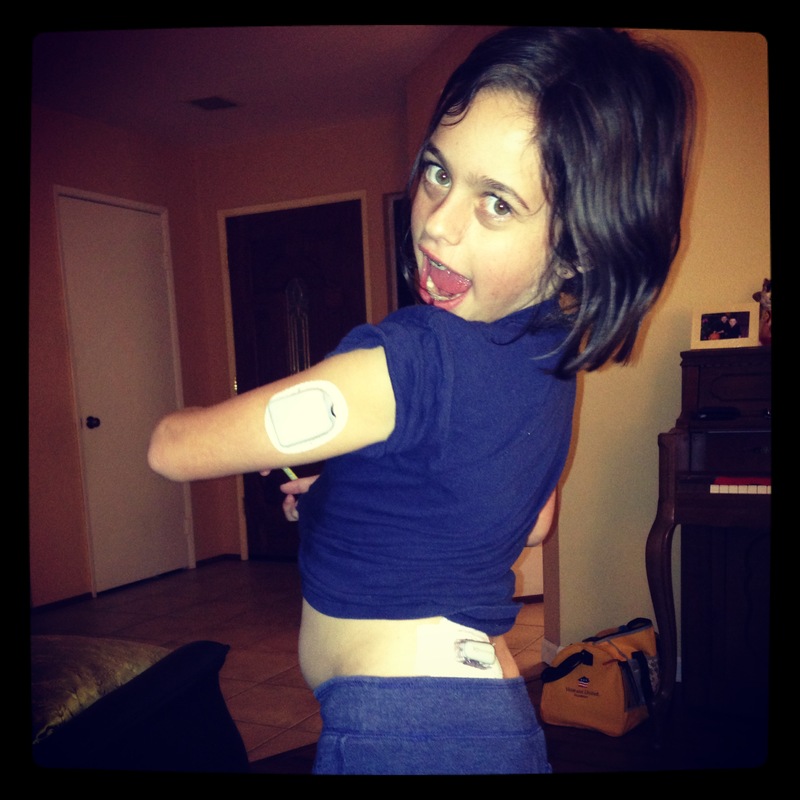 We get a lot of questions about V’s insulin pump. How does it work, exactly? Does it do everything by itself? Does it do our dishes too? It has a remote control, aka PDM (Personal Diabetes Manager) that acts as a meter, communicates with the pod, and is essentially the brain of the pump. The pod is attached to the body by an adhesive and delivers the insulin subcutaneously via a cannula. Check out this page that explains exactly how everything works, and make sure to click on the “Watch just how easy it is” link to see a brief video. The pod needs to be changed every 3 days, which is a huge improvement from having to give multiple daily injections. Is it virtually painless? Not according to V. She says that insertion hurts, albeit for just a few seconds. Still, one “shot” every 3 days is far better than a minimum of 4 shots every day. I wish the pump would do everything by itself. One day it will, and it won’t be a pump anymore – it will be an artificial pancreas. But for now it goes like this: V checks her blood sugar. The pump asks her if she is going to eat and if yes, how many carbs. After that, the pump uses a formula determined individually for each person by their doctor to calculate how much insulin to deliver to cover the food or to correct for high blood sugar. 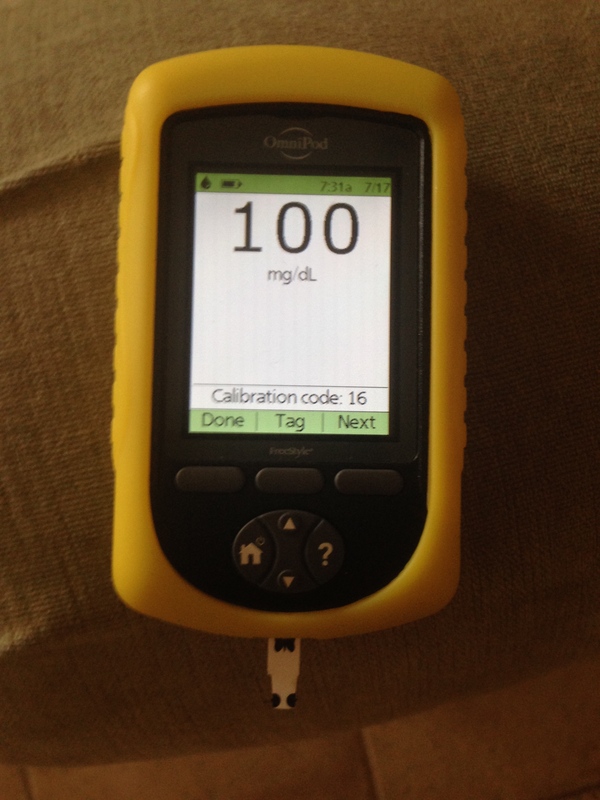 Aside from bolusing or correcting for high BG, the pump delivers the basal (background) insulin via a continuous drip. It is waterproof, so V does not have to worry about removing it before taking a shower, swimming in the pool or when hanging out at the beach. The pump does not do our dishes but it does make our lives a lot easier. Besides the obvious ease of giving insulin to cover for food, there are other options that we use often. We are able to suspend insulin delivery if V is low. We are able to change the amount of basal insulin based on her needs. For example, we often decrease it for physical activity and increase it on days she is sick or sedentary (e.g. on a 5 hr cross-country flight). For meals that are high in fat and protein we are able to give some insulin upfront and then spread the rest over few hours. When V is asleep we are able to manage her insulin without having to wake her up. We don’t have to keep a written log as all records are kept in the PDM. We can download the data and view the patterns that can help us better understand what is going on. On the flip side, the pod leaves marks on V’s body. 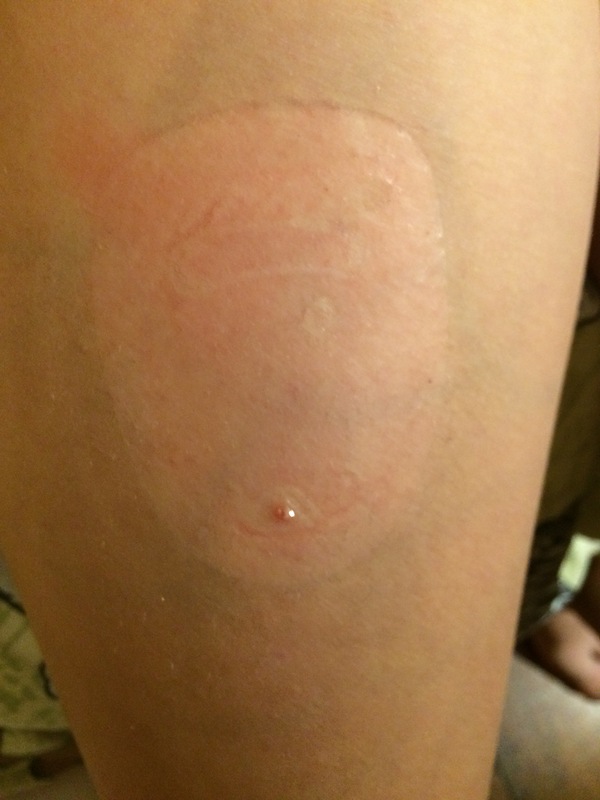 There may be a mild rash from the adhesive or a little bump in the spot where cannula was inserted. One time V developed a nasty infection at the pump site – that is something that occasionally happens to just about any pump wearer. The pod had gotten ripped out a few times. It starts beeping an hour before it needs to be changed and keeps beeping on and off until it is finally changed. When something goes wrong it alarms and the sound it makes is very loud and obnoxious. We are always hyper-vigilant about losing the PDM. And because the pod is usually worn in a visible place, it makes V’s Diabetes more visible too, to herself and to others. All in all, for us the benefits far outweigh the disadvantages. V has been on the pump for 10 months now and there has never been a time we wished she were back on multiple injections.